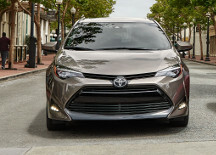 The 2019 Toyota Corolla is the perfect compact car to add to your daily drive, but what makes it tick? Toyota of Braintree in Braintree, MA, has a diverse selection of Corolla models available in our new inventory. Browse through the following model review and pick out your favorite. If you have any questions regarding the impressive Corolla, feel free to contact our team online or give us a call at (781) 848-9300. Up to 40 MPG- Save big at the pump when you get behind the wheel of the 2019 Toyota Corolla. This compact car is built for impressive fuel economy that keeps you on the road for longer distances. 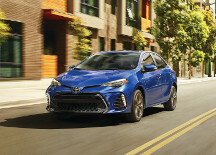 Up to 140 HP- Paired with a powerful fuel economy, the 2019 Toyota Corolla provides impressive horsepower that's also built to keep you on budget while at the pump. Seats five- You and four passengers can sit comfortably in this innovative interior cabin. This compact car doesn't lack space when it comes to keeping everyone relaxed. 13 cu.-ft. of cargo space- Have peace of mind that you'll have the cargo space you need when you make a grocery run. The 2019 Toyota Corolla has the perfect amount of space necessary for whatever your cargo needs may be. With a modern interior dashboard and endless comfortable aspects, the 2019 Toyota Corolla won't disappoint with its leather-trimmed tilt-and-telescopic steering wheel and smart key system. With the Entune™ Audio Plus system with a 6.1-in. screen, tech has never been so easy to acquire in a compact car. 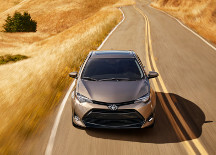 Start your commute with the Toyota Safety Sense™ and Star Safety System™ when you drive the 2019 Toyota Corolla. This compact car holds eight airbags as well as driver and front passenger whiplash-injury-lessening seats. When you get behind the wheel of this capable vehicle, you'll always have head-impact protection structure and front and rear energy-absorbing crumple zones. Choose between the 1.8L Dual VVT I4 with 132 HP or the 1.8L Valvematic I4 with 140 HP. 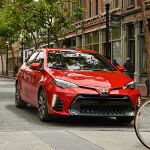 The 2019 Toyota Corolla wants to provide you with one of the best fuel economy models available. 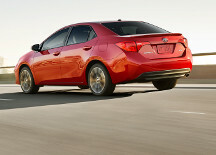 With the 1.8L Dual VVT I4, the Corolla provides 28 MPG city and 36 MPG highway. The 1.8L Valvematic I4 has a fuel efficiency of 30 MPG city and 40 MPG highway. 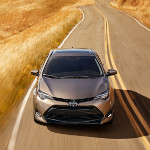 Feel free to take advantage of one the multiple lease offers and incentives available at Toyota of Braintree. Our dealership in Braintree, MA, is here to assist you in sticking to your budget and driving off our lot with the compact car you love. Learn more about the Corolla?